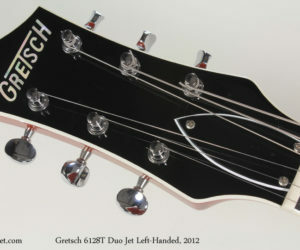 Here is a 2012 Gretsch 6128T Left Handed Duo Jet! 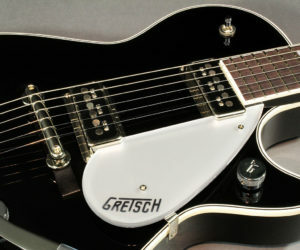 The Duo-Jet has been one of Gretsch’s most popular rock models since the 1950’s, and was the guitar that George Harrison used on the first few Beatles albums. Based on the 1957 Jet George Harrison bought second-hand in the early 1960’s, this is a wonderful guitar. It’s got a unique sound; DynaSonics don’t really resemble anything else and are one of the best-sounding single coils. Priced at $3500 CDN with tweed case.